The collar on the neck of your dog is like the wristwatch a person wears, showing the status, taste or even character of the dog's owner. 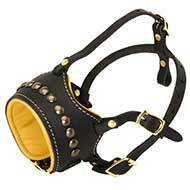 Decorative leather collars are most popular as they are quite beautiful, comfortable and can serve your dog for a lifetime. Exclusive design - one of a kind! 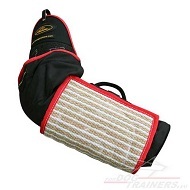 This Collar is extra wide (1 3/4 Inch), which makes it perfect tool for handling large and active breeds. We use very strong, thick perfectly oiled and selected leather. 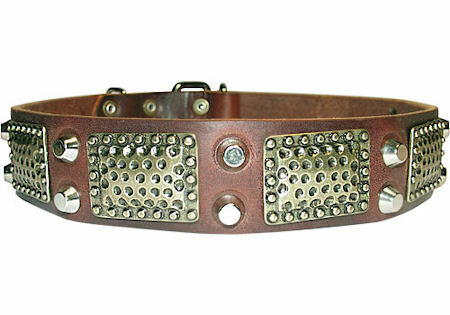 This collar is decorated with brass massive plates and nickel pyramids. We use heavy nickel hardware, 1/2" solid steel nickel-plated pyramids. Pyramids are hand set with brass rivets. 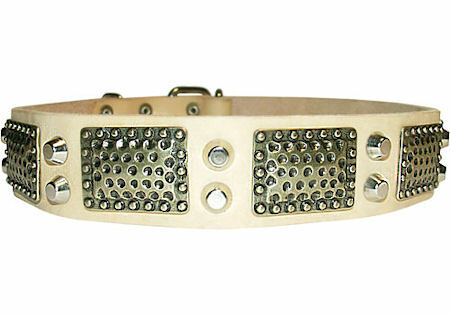 Hand set brass rivets secure the stainless steel buckle and D-ring (for tags and leash). 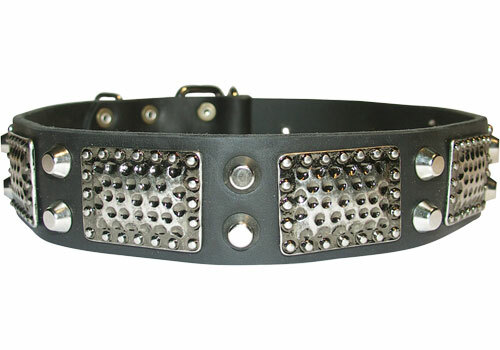 This collar will fit dogs with neck size 18 inch and up to 31 inch (45 cm - 78 cm).